Wally announced a new 83 metre explorer yacht concept at the Monaco Yacht Show today (September 28), which is the first result of a new partnership with German yard Nobiskrug. 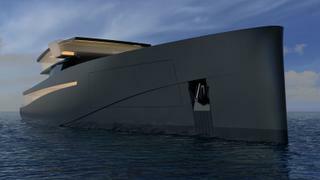 Holger Kahl, managing director of Nobiskrug revealed that the idea for a larger Wally motor yacht was put to him by the Italian yard's founder Luca Bassani. Details of the 83 metre yacht are being kept confidential, but it is understood that the upper deck will feature two superyacht swimming pools measuring two metres by 20 metres. The rest of the deck will be left bare to allow for a wide range of uses, from entertaining to dining and toy storage. Meanwhile, the satellite domes will be incorporated into the superstructure, continuing a theme established on the Wallypower 118 Galeocerdo. Key features include an upper-deck owner’s cabin, with its own private terrace overlooking the aft deck, as well as a side-loading tender garage, which is situated in the bow. The interiors have been developed in collaboration with British studio Winch Design. Speaking to Boat International, founder and designer Andrew Winch added: “It is great fun and a great honour to work with Luca Bassani. This has been a dream of mine ever since I saw the first Wallygator. This project has been a bit like a snowball rolling - it has come together very quickly." Bassani adds that length of the Wally explorer yacht could be modified to suit an owner’s needs, with a minimum LOA of 70 metres. Other superyacht projects currently under development at Wally include the Wally 93 custom sailing yacht, which is due to hit the water next year.